Winter road safety is adding salt pollution to Great Lakes streams, according to a recent government study. Workers spread salt on Milwaukee street. Photo by Michael Pereckas. The U.S. Geological Survey examined approximately 100 streams in 19 northern states for road salt and other sources of chloride. Of the 52 streams tested in Great Lakes states, a quarter had chloride levels that exceeded federal standards designed to protect drinking water supplies. Levels higher than 250 milligrams per liter give water a salty taste, according to the study. Excessive chloride can also be harmful to fish, plants, insects, worms and macro-invertebrates, said Kevin Cronk, a monitoring and research coordinator for the Tip of the Mitt Watershed Council, a northern Michigan group that advocates for water quality. Chloride has increased in all lakes and streams in northern Michigan, Cronk said. “If they are seeing levels that high, they must be talking about a highly urbanized area,” he said. 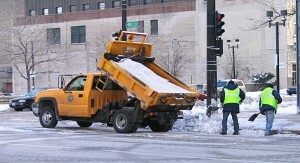 Most streams that tested high are where road salt and other chemicals are used to deice roads, according to the study. Winter road safety accounts for 40 percent of the use of salt in the United States. Highway officials reported using from as little as 10 tons to as much as 30 tons of salt for one mile of road lane in all of the states surveyed. In Great Lakes states, the study found New York officials used 70 tons of salt to deice the Croton Watershed, an area north of New York City. Officials in Harrison, Ohio used the least amount – only six tons per lane mile. Other sources of chloride in streams are landfills, drinking and wastewater treatment and natural sources. Chloride is a good indicator of human activity and population increases, Cronk said. High levels may also mean harmful chemicals leaking from cars are also ending up in streams. Great Lakes Echo journalists report on the environment. Our heavy use of road salt in this state is an embarassment. We have the rustiest cars of any state in the union, and this is just the beginning….Salt also gets into the groundwater and surface water. A few decades ago there were not any reliable subsitutes but now there are. Pottasium formate and Calcium Magnesium Acetate are two good ones. They cost more up front but do not damage our ecosystem or corrode out physical assets such as our cars, roads, bridges, signs,etc/ In fact, a recent study from Chevron Chemical company shows that eaach ton of salt causes $1500 of damage due to corrosion…It is time this state, which has more great lake coastline than any other state, start taking this salt problem more seriously. In fact, Canada has already taken steps to cut back on salt use, as have other states and the European Union. If Michigan really wants to be a leader than we need to lead and not be last in line when it comes to salt abatement. I am a landowner in Pennsylvania who just had a Penn DOT truck turn over above a fish containing pond. The issue of civilizations impact on the environment, the biosphere, is reflected in the internal environment of our fawna and ourselves. My sudden, personal experience regarding the issue of salinity and contamination of our water tables with organic and inorganic chemicals punctuates my long held concerns about this issue. As a physician, I have focussed on the benefits of nutrition and removal of “xenobiotics”, those inorganic and organic chemicals that interfere with normal biochemistry. We need to be more sensitive to the biosphere we leave succeeding generations. Balanced stewardship of our world with moderation of negative effect our civilization has on living systems is neccessary for ours and their survival. I will monitor my situation closely with reports. It would be economically, and environmentally wiser to simply plow the roads when temperatures fall below 20 degrees, Fahrenheit. The snow may compress from traffic, but it does not stick to the cold road surface and may be plowed off. There is no salt damage and the roads remain ice free. Light snow simply blows off the surface or is easily plowed off. When salt is applied the snow freezes to the surface and ever greater applications are needed to clear the surface. Additional benefits are less corrosion to vehicles and bridges and reduced environmental damage.